Few countries have such a rich and varied history as Turkey, where East and West meet, or are as perfect for a yacht charter. Although the cities are very much grounded in the modern world, its culture and architecture have been influenced by the Byzantine, Ottoman, Roman and Persian empires. The southwestern coastline, known as The Turquoise Coast, shows some of the strain of recent tourist development, but it is easy to discover unspoiled gems: each town and island has its own magic, whether it be accessible ancient ruins, sweeping beaches, quiet anchorages, or lovely cafes and restaurants. This season, Zoom Zoom Zoom, a 49m launched by Trinity Yachts in 2005, will be cruising Turkey’s waters, and we caught up with her knowledgable captain Scott Kynoch to get some insider information on a motor yacht charter in Turkey. So why Turkey, and where in particular? There are so many great anchorages, bays and islands along the Turkish coast, and the great thing is, a lot of them are close together so it’s easy to change anchorage with just a few hours cruise. Fethiye is great because guests can go ashore and look at all the bric a brac shops and the bazaar. It’s a unique place – you can go and drink Turkish teas and try those nargile pipes (hookah or shisha pipes) and guests often buy them. You also have these amazing, thousands of years old Lycian tombs carved into the rock faces there which you can visit. Fethiye market is also worth seeing too – as well as fresh fruit and vegetables there are all kinds of stalls selling games, household goods, clothes, jewellery – you name it – it’s in there somewhere. The Bay of Fethiye and over towards Gocek is great – you just can’t go wrong – there are hundreds of little bays where you can anchor – put out couple of lines and get in really close. 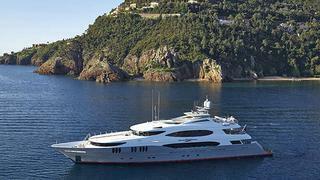 If they want to, guests can scramble up the rocky coast and get great photos looking down on the yacht. The water is crystal clear, a deep, rich blue – it’s calm, and it shelves off so quickly into deep water that even a large yacht can get tucked right in to a small cove. There is some beautiful snorkelling: there are some sandy beaches, and lots of pebbly ones. You also don’t need licences to jet ski in Turkey and there’s some superb bays for watersports here. There are pararsailers around too – which some guests might like to try. There are also local guys who come out in little boats selling fresh breads, crayfish, squid, fish and sweets like real Turkish delight – that can be good fun for the guests too. Also, from here, Rhodes is just a short hop away and that’s an amazing place to visit – full of history, and it’s stunning. There are some sensational spots in the ‘Twelve Islands’ area in Fethiye bay, and right in the Southwest corner is a great restaurant – really authentic where the guy will cook you a whole lamb. It’s so nice, very calm, a real local experience. Gocek itself is very quaint; you can hear the call to prayer from the mosque which is very evocative. There’s a nice little dock and it’s quite a high end sort of place. In Marmaris there is a huge nightlife scene. You can take a berth literally just a five minute walk from the heart of the action. There are some great restaurants where you can go for a meal before heading to one of the smarter nightclubs. There are also some beautiful anchorages in this area, lots of deep, protected bays. Bodrum’s good to, but I tend to stay away from there because it is the hub of yachting so gets a bit busy in high season. September is great and it can stay warm enough right up until mid October. But you increasingly come up against a bit of inclement weather. It’s much quieter; there are always yachts around but mostly the smaller sunsail-type bareboat charters. Any words of advice for first-time charter guests? If possible, get the preference sheets back early then we can cater for the kind of experience you’re after. If you don’t ask for something on the preference sheet then how are we supposed to know you want it? Let us know if there any birthdays or significant dates while you’re on charter. And not to sound melodramatic but please let us know about any health issues. And as for the cruising itinerary – of course we can always do one or two overnight passages in a charter – but don’t try and ‘do’ half of the Mediterranean. If you do, you’ll end up spending too much time at sea and then people will get very ratty. And be prepared that there might be inclement weather – we can’t control that! And that this might mean the itinerary has to change – we might have to move, or not be able to move if the weather makes it too dangerous. If you know what ports you really want to visit – let us know well in advance – especially in the Mediterranean they get totally booked up. And think about what size of yacht you’re chartering – if it’s a 40m with just 7 crew then you won’t be able to get ‘all the bells and whistles’ in terms of service 24/7. 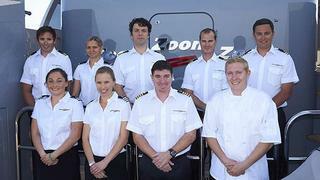 Of course the crew will always do their best – but it’s a different experience to a larger yacht with twenty-plus crew. What should guests bring with them? I wouldn’t like to tell a guest what they can or can’t bring! It’s really up to the brokers to help with that. There are laundry facilities on board – although if you do bring two weeks of dirty laundry with you it probably won’t all be ready the next day (that does sometimes happen)! Hopefully people will feel we are professional, friendly, open, and relaxed. And that we’ll do everything to make your holiday what you hope and expect it will be. My crew work hard and always show the clients respect, and I expect them to be treated with respect in return. But whatever happens, we’ll be here with a smile on our faces creating a relaxing atmosphere – relaxing for the guests that is; behind the scenes we’ll be working really hard. There’s no running around and shouting – to the guests everything will appear to run smoothly in a calm, efficient, punctual fashion.